Above - A Google StreetView Image of the site of Balmbra's Music Hall, Newcastle - Click to Interact. 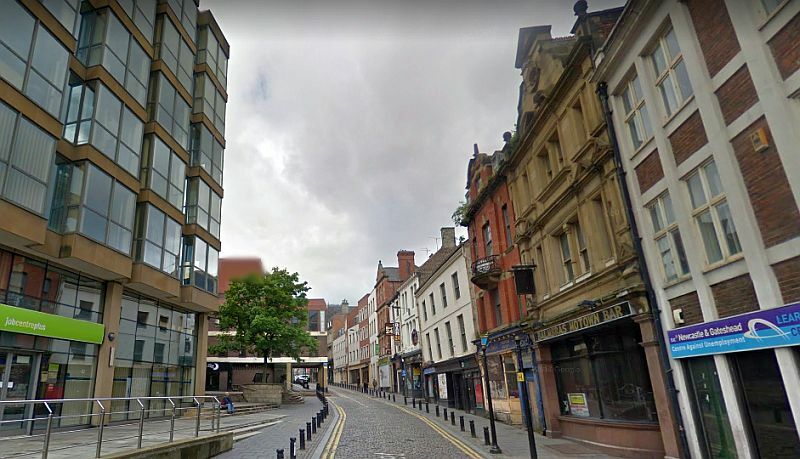 Balmbra's Music Hall began life as a large room situated on the first floor of the Wheat Sheaf Inn at number 3, Cloth Market, Newcastle. The Inn was constructed in 1840 and it's first landlord was the Victualler John Balmbra who advertised in the Newcastle Courant saying:- 'J. Balmbra begs most respectively to inform his Friends and the Public, that he has entered the above newly-built commodious Premises, and laid in an extensive stock of highly-flavoured Wines, Foreign and British Spirits, fine sparkling English and Scotch Ales, London and Dublin Stout. An excellent Skittle Ground is being fit up. Good Stabling, &c.' - The Newcastle Courant, 27th of November 1840. 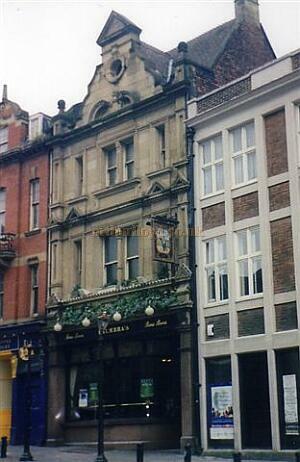 Right - A photograph of Balmbra's Public House in 2002 - Courtesy Gareth Price. This building replaced the earlier Balmbra's Music Hall in 1901 after a fire in 1899. Often used for public auctions, a large room on the first floor of the Inn was in use for Concerts by 1848, and by 1850 the Inn was being reported on as a 'place of amusement'. A report in the ERA of February the 10th 1850 said:- 'Wheatsheaf Saloon - (Proprietor, Mr. J. Balmbra.) - This well-conducted place of amusement still continues to receive that patronage which it deserves. Among those singers who shine most brightly are Miss Manton, Miss Clifford, and Yanke Mellor, who has recently returned here to his many admirers and friends.' - The ERA, February the 10th 1850. By May 1850 the room was being reported on as Balmbra's Music Saloon, the ERA carried the following report in their 19th of May 1850 edition saying:- 'Mr. Balmbra's Music Saloon - This popular establishment continues to increase in attraction, the succession of novelties which the enterprising and indefatigable manager brings forward for the entertainment of his patrons drawing every night crowded and respectable audiences. The utmost harmony and good feeling pervades the company, each member seeming to vie with each other, not only in promoting his or her professional reputation and respectability, but the interest of an establishment which has for years sustained a celebrity surpassed by few, if any, in the provinces.' - The ERA, 19th of May 1850. 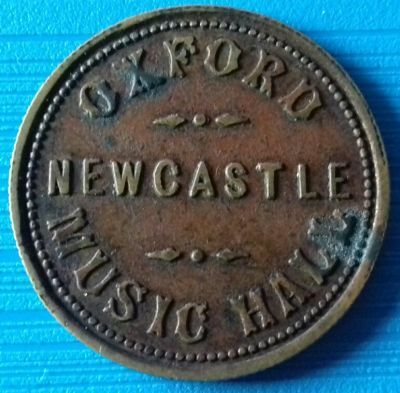 Left - An early Entrance Token for the Oxford Music Hall, formerly Balmbra's Music Hall, Newcastle, whilst under the management of J. T. Bagnall and W. W. Blakey - Courtesy Alan Judd. The building would later become known as Balmbra's Music Hall, but would eventually be renamed the Royal Music Hall in 1859, and then the Wheatsheaf Music Hall in 1864. The Music Hall's final incarnation in this original building would be the renamed Oxford Music Hall of 1865. Both sides of an early Entrance Token for the Oxford Music Hall can be seen on this page. 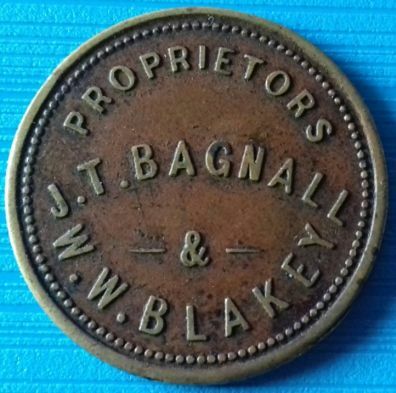 Right - An early Entrance Token for the Oxford Music Hall, formerly Balmbra's Music Hall, Newcastle, whilst under the management of J. T. Bagnall and W. W. Blakey - Courtesy Alan Judd. The original 1840 building was demolished after a major fire in 1899 and a new Public House was then constructed in its place in 1901. 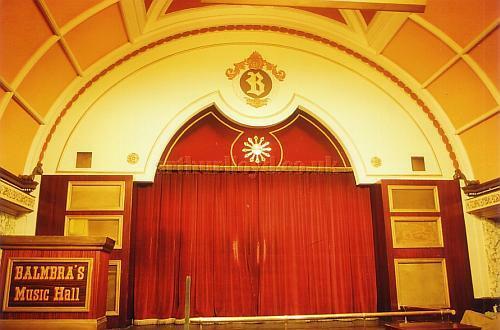 This building was subsequently converted into a Music Hall recreation called Balmbra's Music Hall in 1962, in homage to the original Balmbra's of 1848, see the photograph of its auditorium and stage below. Above - The Interior of Balmbra's Music Hall, Newcastle in 1979 - Photo Courtesy Ted Bottle. Due to the fire of 1899 nothing remains of the original 1840 building today but the replacement building of 1901 was still standing at the time of writing in December 2017. However, at this time the building, which was sporting a sign saying Balmbra's Motown Bar, was closed and up for sale.